House is designed to entertain large family groups to enjoy relaxing country valley views in the comfort of a modern central heated house. Self-contained, well-equipped kitchen, dining table seats 12, 3 bathrooms, 2 living areas decked out with comfortable modern furniture. Plenty of outdoor sports equipment, in the play shed;table tennis & pool table, dart board, cricket set, footballs. A great collection of quality reading books and numerous board games for the snowy / rainy days. Kitchen is equipped with cookware and utensils. Located two and a half hours drive from Sydney, one hour beyond Katoomba over the Great Divine, Casey's Farm House is just ten minutes from the township of Oberon. 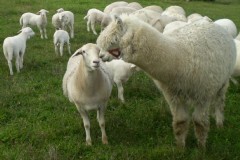 From Sydney, travel 170 km West along the Great Western Highway through the Blue Mountains to Oberon. Heading North from Oberon, 11.64km along Hazelgrove Road towards Tarana, Casey’s Farm House is on the right-hand side of the road. Rural Address in 1164 Hazelgrove Road. Accommodates up to 12 people. 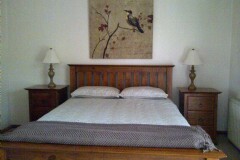 The farm house has 6 spacious bedrooms, 3 Bathrooms, 4 Living Areas -[Kitchen/Dining/Lounge x2]. Upstairs there are 3 bedrooms (main with ensuit), 2 bathrooms, open plan kitchen/dining & living room with log fire (central heating)& second lounge/sitting room. The main bathroom has toilet, shower and a spa bath. Down stairs has 2 bedrooms, parents & kids retreat, laundry/bathroom with third shower & toilet. The farm house has central heating throughout. The open plan living / dining area has a custom made dining table seating for 12 guest, modern timber kitchen and leather lounges in living areas. Doonas, pillows & pillowcases are provided, bed linen can be provided for a small fee, and a portable cot is available. All bedrooms have central heating. The work shed has been converted into a games shed, with pool table, table tennis, dart board, TV, CD Player, ball games, sporting equipment and more. Outdoors BBQ facilities and relaxing open gardens. 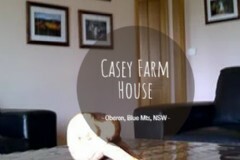 Your details will be emailed directly to Casey's Farm House. Please check your contact details are correct. Complete your details below and your enquiry will be emailed directly to Casey's Farm House. Please check your contact details are correct to ensure the quickest possible reply.